They fought it out last night, John McCain and Barack Obama on network television. I don’t know who won or lost or earned a point (I’ll admit I didn’t tune in), but regardless of whom the winner was and who wins in November, we can all cheer on our one common patriotic thread: Team USA – while wearing the name of the potential next President of the United States of America. 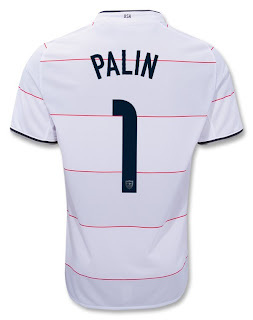 And yes, Palin fans, we’ve made Vice-Presidential candidates jerseys as well. Because maybe one day Donovan or Adu will be awarding your Commander in Chief a similar jersey after winning the World Cup. Okay, the likelihood of that happening anytime soon is about as much as McCain winning the Boston Marathon. But it would make one heck of a statement to go to a USA match wearing one of these unique jerseys; and if you’re afraid of stirring up political uproar, buy one of each and give one to your friends, that way every party will be duly represented. Here at World Soccer Shop, we love all parties! If only we could have such harmony in Washington.